Welcome to the latest episode of Delta Dispatches. 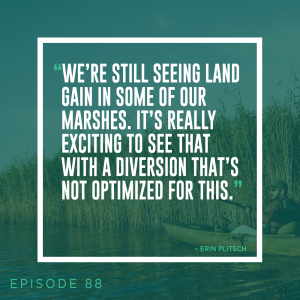 This week Simone and Jacques talk with Erin Plitsch of Coastal Restoration and Protection Authority. Erin is a Coastal Resources Scientist with CPRA’s Operations Division in New Orleans and also serves as Chair of the Caernarvon and Davis Pond Freshwater Diversion technical working groups.